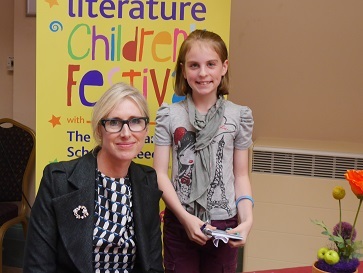 Multi award-winning author and illustrator Lauren Child earned a new accolade after her appearance at Ilkley Literature Festival last weekend – the prize for the longest book signing queue! Lauren’s appearance was one of the first in a lively programme of events for families at this year’s Children’s Festival which is sponsored by The Grammar School at Leeds (GSAL). With Lauren’s books ranging from picture books for very young children to the Ruby Redfort series for pre-teens, and the adaptation of her characters Charlie and Lola for TV, it was no surprise that her appearance drew the crowds. Following a Q&A session with interviewer Nick Tucker in front of a packed Kings Hall audience, Lauren spent another two hours meeting her fans and signing books. The Children’s Festival continues this weekend with activities for children of all ages, including author sessions with Yasmeen Ismail, Angie Sage, Caryl Hart and Kjartan Poskitt. Children can join in circus skills with Suitcase Circus, drama with Mud Pie Arts, storytelling with Ilkley Library staff and a blast from the past with children’s museum Eureka! Children are also invited to send in their festival reviews and the best will be published on the GSAL website. To book for Children’s Festival events, call the Box Office on 01943 816714, book online or purchase on the door subject to availability.